Multi-Flow believes that a beverage in its purest state – using natural sweeteners, natural flavors and natural colors – blends the iconic heritage and traditions of the American soda fountain with the sophisticated, healthful sensibilities of the modern socially-aware consumer. With an unapologetic devotion to that principle, Fountainhead Gourmet Craft Sodas delivers unique flavor profiles that complement your inspired cuisine, satisfy your customers' desires and set you apart as a Chef, Restaurateur and financially-savvy Foodservice Operator. 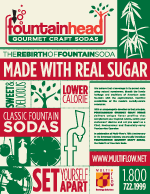 In celebration of Multi-Flow's 75th Anniversary in the beverage industry, we proudly introduce Fountainhead Gourmet Craft Sodas, the Rebirth of Fountain Soda. SET YOURSELF APART with lower calorie, sweet and delicious, real sugar sodas! Contact Multi-Flow at 1.800.722.1999 to learn more about Fountainhead Real Sugar Carbonated Soft Drinks.